In the majority of the system, it is necessary to catch the bus by standing at a red, white and blue HARTransit bus stop sign. Be ready at least 5 minutes before the bus is due to arrive. Deer Hill Avenue in Danbury. Hillside Avenue, Sunny Valley Road, Dodd Road and Old Park Lane in New Milford and on Federal Road between Junction and Silvermine Roads in Brookfield and in areas of road construction on Route 7. Route 7 south of the Danbury Mall. On any buses traveling in New York State. To board in an area where flag stops are in effect, stand near the curb and wave to the bus. Do not wait on a curve, next to a right-turn lane, or on the opposite side of the street from the bus. Drivers are not authorized to stop for passengers flagging down the bus where bus stop signs are installed, unless the system is on snow routes. HARTransit welcomes bicycle riders to travel on the bus with their bikes. Every Citybus vehicle is equipped with two bike racks. Standard bicycles are not permitted inside HARTransit Vehicles. Folding bicycles, as long as the passenger maintains control over them, are permitted inside vehicles. Service animals are welcome on HARTransit vehicles. If you travel with a service animal. Pets up to 20 pounds may be transported in carriers designed for that purpose. Drivers cannot help passengers carry pets. HARTransit buses accommodate all wheelchairs, scooters or other mobility devices up to the maximum physical dimensions and constraints of the bus. HARTransit vehicles have lifts and ramps with an 800 pound capacity. 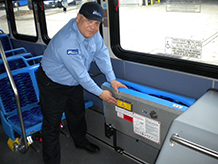 Drivers are trained to safely operate wheelchair lifts and secure mobility devices on the bus. Scooter users are asked to transfer to a seat after boarding. Most scooters cannot be tied down as securely as a standard wheelchair and are not designed for use on a moving vehicle. Other mobility devices such as walkers and canes are accommodated. Passengers that have trouble with steps may use the ramp. Respirators and portable oxygen are also permitted. Grocery bags and parcels are permitted on HARTransit vehicles, but passengers must maintain control over these items and carry them on the bus themselves in one trip. HARTransit will make reasonable accommodations to passengers with disabilities that need more assistance. Items with wheels, such as carts or strollers, must be collapsed during travel. HARTransit reserves the right to deny bus service to anyone who habitually abuses the service; whose conduct on board vehicles interferes with the safe operation of the vehicle; who disrupts vehicle scheduling; who behaves in a way that is offensive to other passengers and interferes with and/or disturbs the operations of the vehicle, or otherwise violates HARTransit policies. Acting in a manner threatening to the safety of drivers or passengers or engaging in seriously disruptive or objectionable behavior that interferes with and/or disturbs the operation of the vehicle. Smoking, carrying a lighted cigar, cigarette, cigarillo or pipe, use of any spark, flame, match or fire producing device. Possession of open containers of alcohol or other liquids. Consumption of food or drink. Playing of audio or video devices without earphones. Entering or riding a vehicle while intoxicated or under the influence of illegal drugs. Lack of shirt, pants or shoes or clothing in a condition objectionable to other passengers. Carrying gasoline, kerosene or other flammable liquids. Obstructing, jumping from, or riding upon the steps of a HARTransit vehicle while the vehicle is in motion or standing. Defacing or damaging HARTransit property. Announcements with detailed descriptions are posted a week ahead of the holiday. Shuttle riders should take note that on Christmas Eve, New Years Eve and single days bridging holidays with weekends Metro-North will run an altered schedule that may affect the operation of connecting HARTransit services. Items found on buses are secured in the Administrative Office at the HARTransit Operations facility. 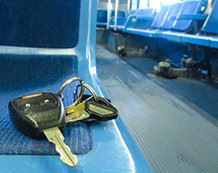 Riders who lose items on the bus should call 203-744-4070 x120. Those that may have lost items on the bus are encouraged to call the office as soon as possible and to pick up items promptly. Items are available for pick up at the Administrative Office during normal office hours. Other arrangements may be made for pickup after hours. Non-perishable items will be retained for a period of 60 days; however, more valuable items will be retained for a longer period. Perishable items will be discarded immediately.